I have been in the market for a new water bottle for a little while now. I already have a great water bottle that I absolutely love, but I would like an extra one for non-water beverages so that I can keep my other bottle strictly for water. After perusing the internet a bit, I came across this bottle at CSN Stores. CSN Stores is a huge online retailer that carries much in the way of home decor and kitchenware, with items ranging from cutlery to counter height stools to barware and wine accessories and just about everything in between. The Takeya Modern Glass 16oz Water Bottle seems like a perfect fit for me. I don't think that I have mentioned it recently, but those of you who follow the blog know how much I love drinking out of glass. 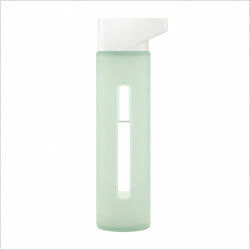 Having a readily reusable glass container to take homemade juices and other non-water liquids with me to class (and elsewhere in the city) will be a wonderful and affordable addition to my current water bottle situation, and the modern look of the bottle is very minimalist and eye-catching, adding even further to the appeal. I am very much looking forward to reviewing this bottle once I get mine in. That's a pretty tight looking water bottle.